The typographic incitement of the reader to participate in reorienting the page also reveals additional text, hiding in plain sight in the fold between pages two and three. “Art should not explain life but change it,” proclaims Karl Marx from the liminal space that our manual redirection has just imparted with a new significance.18 In provoking our movement, Richter’s potentially preachy—or worse, decorative—filmic diagram asks us to demonstrate G’s radical potential for ourselves instead of relying upon polemical verbiage. Our manual rotation of the page unlocks instructions for activist praxis that Marx’s words punctuate rather than dictate, continuing Richter and Werner Gräff’s call for collective participation on G 1’s first-page (to which we will return). After the eight-month hiatus following the printing of G 2 in September 1923—a disappearance likely related to Germany’s economic collapse—the journal reappeared with its third issue in June 1924. With sixteen times the number of pages as the first two foldout tabloids, the new bound publication barely resembled its flimsy predecessors, its weightiness perhaps an attempt to rectify the lengthy absence.19 Though we find Richter’s writing throughout G 3, notably in the newly-updated statement of purpose that introduces the journal’s contents, he saves his most explicit treatment of film for the middle pages of the issue.20 Richter prefaces “The Badly Trained Soul” with “sketches for a FILM” [emphasis in reprint] by Viking Eggeling, a fellow pioneer in filmic abstraction whom his former collaborator continues to praise throughout his essay.21 After disparaging current trends in cinema, Richter discusses the characteristics of the “optical rhythm” he seeks in his own filmmaking through a process based upon “groundbreaking research” for which he thanks Eggeling (146-47). According to Richter, no matter their subject matter, films should act as a means to awaken the senses rather than distracting with “crude effects” (146). As in G 1, printed filmstrips, which remind us of Rhythmus 21’s rectangular sequence as well as Rhythmus 23’s multi-pronged animated abstractions, provide examples of “dissimilitude” and “unified shaping” as illustrations of filmic movement that exercise rather than lull our perceptual capabilities (Richter, 148-49). 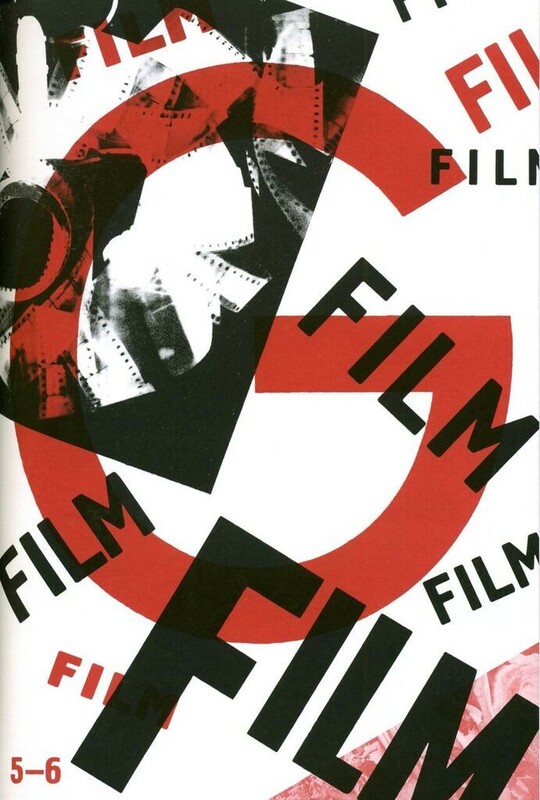 The suggestion that cinema can inform space beyond itself through Richter and El Lissitzky’s commingling of filmic and typographic language on the page in the journal’s first issue becomes an imperative in G 3. For Richter, enhanced filmic perception unlocks an “ability to think” that “gives the soul the means to power: judgment and activity, that is, qualities that benefit the whole individual in his action and are indispensable for his overall orientation” (148). In other words, our future progression as a human race could be guaranteed if only we utilize cinema productively. Moving to the facing page, however, the issue’s next consideration of film contracts dramatically into the G-group’s contemporary moment. An essay entitled “Rhythmus,” which might seem to suggest a text devoted to Richter’s multipart film project of the same name, in fact, explores a more general definition of filmic rhythm that extends his practice into a theoretical model. Here, the ambiguously-labeled text obliges us to move forward without the presence of a fixed author as it champions structural flexibility in film and warns that we should “beware of defining cinematographic rhythm at this stage; let’s open our eyes instead.”27 The first two pages of the article’s text, interspersed with stills from Entr’acte (Clair and Picabia’s 1924 film) and quotations from Clair and George Sand that hint at the inherent absurdity in film’s struggle for self-definition, culminate in an experiential description of the ideal effects of rhythm on screen: “Someone watching an automobile race on film becomes an active person, grabs the steering wheel, observes the speedometer, and the trees along the highway dart into his eyes.”28 It is only after this evocative passage that Richter brings his own rhythms into the conversation with a detailed written decoding of his illustration, “Section of a score for the film Rhythmus 25.”29 Even this pointed reference to Richter’s specific technique presents itself as only one part of a complex issue. A production photograph depicting the “commanders” of Entr’acte interrupts Richter’s text and emphasizes the fragmentary status of both word and image, here joined together as pieces of a puzzle. 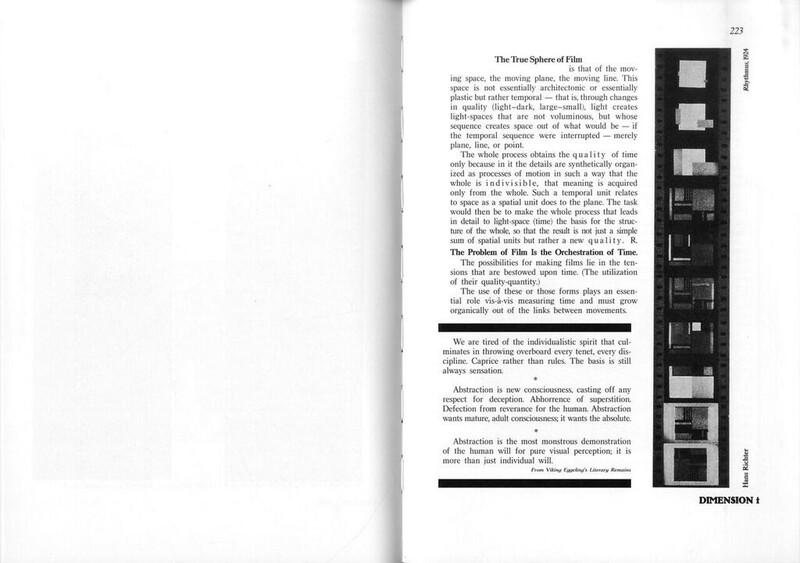 If Richter’s filmic work counterintuitively plays a supporting role in the “Rhythmus” article, the illustrations of his imagery placed in the final pages of the “Dimension” section command our full attention in a manner similar to the filmstrip diagram in G 1. Opposite a textbook review of Introduction to the Elements of Geometry in Motion (Einführung in die Elemente der Bewegungsgeometrie) and a still from Paul Leni and Guido Seeber’s “Crossword-puzzle film,” illustrations of Richter’s Fugue from an absolute film appear in two black and white panels colored with red and green (fig. 3).30 But in order to read the images’ caption, the reader must rotate the journal, rendering the text on the previous page illegible and thus separate from Richter’s image. Encountering the blankness on the reverse of the Fugue images, these color plates may initially seem to be isolated within G 5/6’s sequenced material. Still, after we finish reading Richter’s brief note on “The True Sphere of Film” and excerpts “From Viking Eggeling’s Literary Remains,” we must again turn the page in our hands to access the text that attributes the filmstrip printed at right to Richter (fig. 4).31 It is in the repetition of this turning motion—through which perception translates into knowledge—that G’s form becomes its content in encouraging readers to encounter the journal as Richter hoped one would interact with his films: as an active person, grabbing the steering wheel. The series of maneuvers that the sequence of filmic images and text arranged at the core of G 5/6 produce with subtle coordination construct Richter’s unifying model through rhythmic counterpoint not only in the medium of film as he states in “The True Sphere of Film” but also in the journal’s far-reaching instructive project. Returning to the statement of the G-group’s goals on the first page of G 1 (fig. 5), we find Richter and Gräff’s charge for filmic elements to inform simultaneously the journal’s subject matter and the sensory affect of its design. 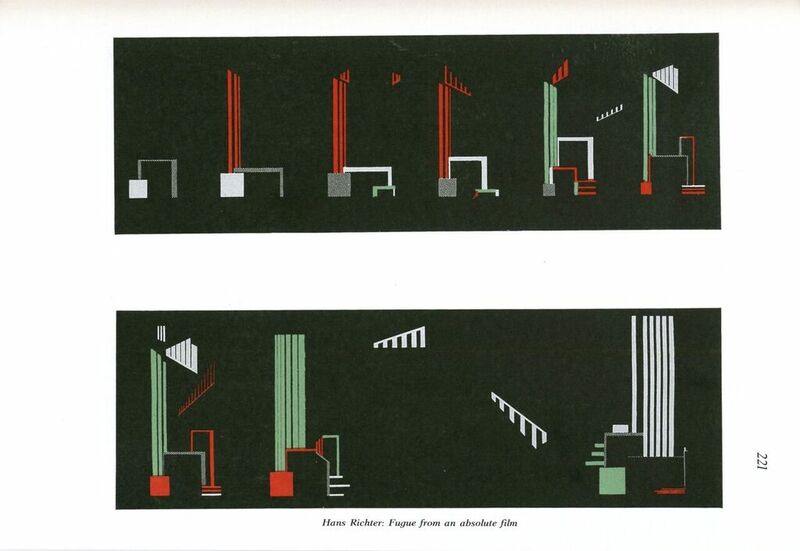 Divided into eight outlined, rectangular segments per El Lissitzky’s plan, the reader must contend with Richter and Gräff’s text in distinct passages. As we negotiate the placement of the various fonts on the stark whiteness of the page within the confines of each segment, we experience each sub-statement as both text and image. Yet, the outlines of each panel also act as frames that organize the space in a rhythmic geometry. The containment and unification of El Lissitzky’s linear divisions certainly meet the economic standards of elemental form-creation that Richter and Gräff outline in their writing, such that the page enacts its own message as a “[p]ure relation of power and material.”32 Likewise, we cannot help but recall the rhythmic motion that Richter advocates in his more overt descriptions of film in later issues of G as our gaze sweeps across the page, the linear passages of text shifting horizontally and vertically as they vary in length and distribution. The filmic rhythm of Richter’s abstract animations that we experience in the subtle melding of form and content on G’s first page informs the structure of the journal as a whole. G’s paracinematic strategy has the potential to engage the reader in a generative action, a phenomenon that Pavle Levi analyzes in his recent study, Cinema by Other Means.33 Levi’s bipartite definition of cinematic technology, which he draws in part from Alexandre Koyré, locates paracinematic production in disjunction between the knowledge of filmic perception (or “logos”) and the equipment (or “techne”) required to produce and project the medium on screen (60). According to Levi, “It is, therefore, only by repeatedly evoking, by enacting, the discrepancy between the idea and its technological implementation that the essential qualities and the radical, non-instrumentalist creative potential contained in any new medium are maintained” (67). In their execution of calculated rhythmic juxtapositions that encourage the reader to negotiate the diverse content of their journal, the G-group managed to create the type of “cinematic dynamo” that Levi describes—a machine that generates unexpected animation through a joining of the reader’s familiarity with the filmic medium and the preset printed page (62). Levi asserts the mental plasticity fostered in the gap between materialized, mass-produced technology and imperfect translations of cinematic vision and in doing so echoes Richter’s rhetoric in his insistence upon filmic perception as a means to gain knowledge (67). But Levi’s formulation of the activist potential of the paracinematic model as one based in the tenuous balance of idea and material does not completely align with Richter’s theory that films themselves could eventually provide the same instructive experience for viewers as the guidelines found in G. Levi instead denies codified cinematic technology the ability to create the widespeard cultural changes that Richter desires. The untamed visual and textual references—the paracinematic disjunctions that require readers’ engagement—are instead synthesized in the predetermined flow of Richter’s films. The universal language the filmmaker hoped his Rhythmus series would disseminate remains within the intangible frame of the screen.34 G’s mobilization, on the other hand, requires the habituated reader’s adept grasp of the wheel. Richter’s attempts to essentialize movement in the absolute forms of his Rhythmus films thus correlate with the G-group’s push to expose but not fundamentally alter the structures of modern life. Still, the question of how G’s participatory montage manifests Marx’s call for cultural change remains. Siegfried Kracauer’s criticism further situates the abstract configurations in the journal’s focus upon urban geometries and in Richter’s filmic shapes in order to unify the overwhelming material presence of modernity within the foundations of capital-driven industrial culture. Kracauer’s analysis of “The Mass Ornament,” which originally appeared in six parts in the Frankfurter Zeitung in June 1927 fits seamlessly within the group’s purview: describing a large group performance by the Tiller Girls, Kracauer writes that “the girl-units drill in order to produce an immense number of parallel lines, the goal being to train the broadest mass of people in order to create a pattern of undreamed-of dimensions. The end result is the ornament, whose closure is brought about by emptying all the substantial constructs of their contents.”35 For Kracauer, as for the G­-group, there exists an elemental, purely formal framework—hidden in plain sight among the visual chaos of modern life—upon which the infinite iterations of industrial cultural production rest. However, in specifying the abstraction at the core of the ornament, Kracauer explicitly connects the visual production of his contemporaries to capitalist ambitions. In fact, he rejects the possibility that artists could clarify or critique the underlying abstraction of the economic constructs that shape a world from which they cannot possibly remove themselves (Kracauer, 79). After witnessing the relative stabilization of the German economy in the span of their journal’s publication, the G-group seems to have accepted the durability of the market to the extent that no sustained challenge to the current economic system appears within the journal. 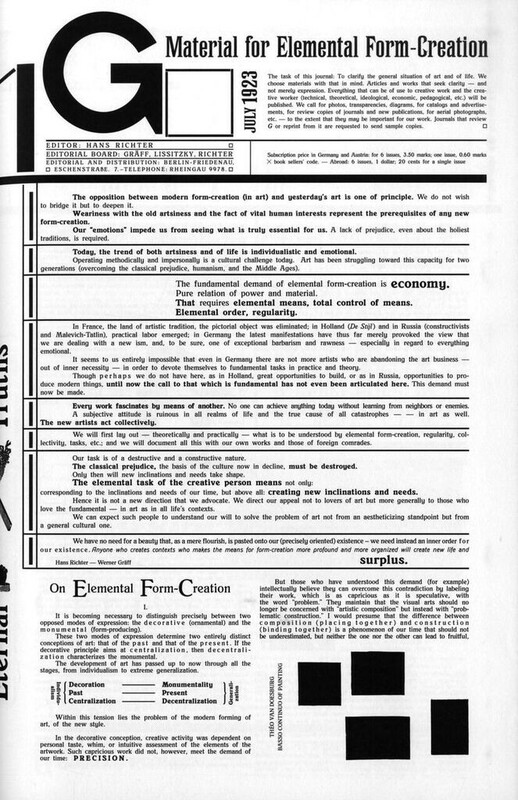 The collaborators’ collection of a range of manifestations of the mass ornament, including images of a Fiat test track and several designs for streamlined high-rises,36 certainly suggest an aspiration to illustrate an all-encompassing abstract expression of capitalist thinking in a manner that Kracauer would likely have found inconsequential, especially by 1927 (Kracauer, 81). Yet, it is the G-group’s attempt to give shape to their contemporary moment that allows the content of the journal (at least in theory) to be absorbed by the action of the masses who handle its pages—consumed, as Kracauer writes, by “the corporeal, allowing them thereby to immortalize current reality” (Kracauer, 85). In the end, then, G does not mobilize individual readers through its paracinematic mingling of elements to send them out alone into reframed but unaltered environments. We are, rather, invited to recognize our membership in a humanity-encompassing collective, of which only some are aware, and in this way we realize the fundamentally abstract shape of our society.37 Richter’s Rhythmus films also show us this universal space, but the filmmaker’s isolated voice in phrases directed toward a single viewer, rising from the obscure intangibility of the screen, does not convey the same shared-ness or crowdedness. 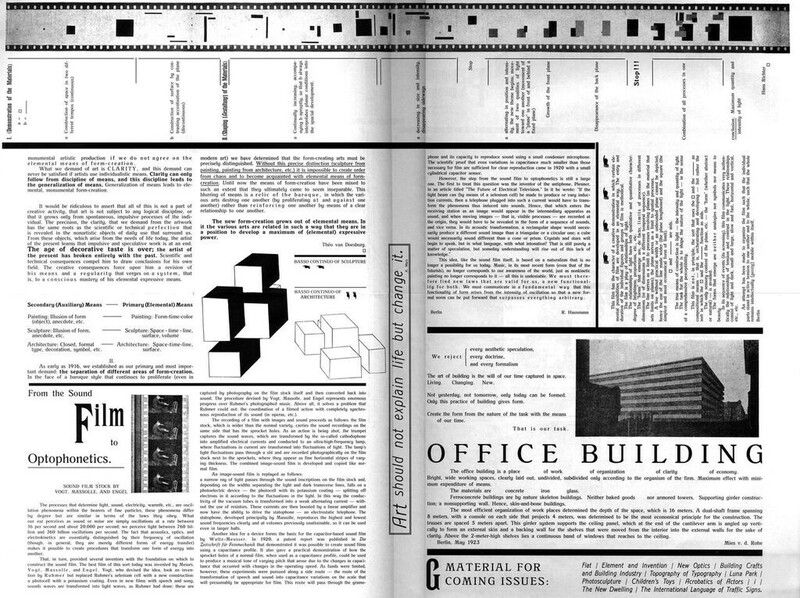 In contrast, the provocative open square positioned in the masthead of G’s two inaugural issues, outlined with four solid black lines barely separated by the white ground of the paper, beckons the beholder’s completion through contemplation—an opportunity to form and reform a collective cinematographic.